Samsung to Unveil New Galaxy Devices at June 20 Press Event in London? According to a press invite posted to Samsung’s public PR site this morning, a planned press event for June 20 could be the spot for the company to unveil at least a couple of new products. 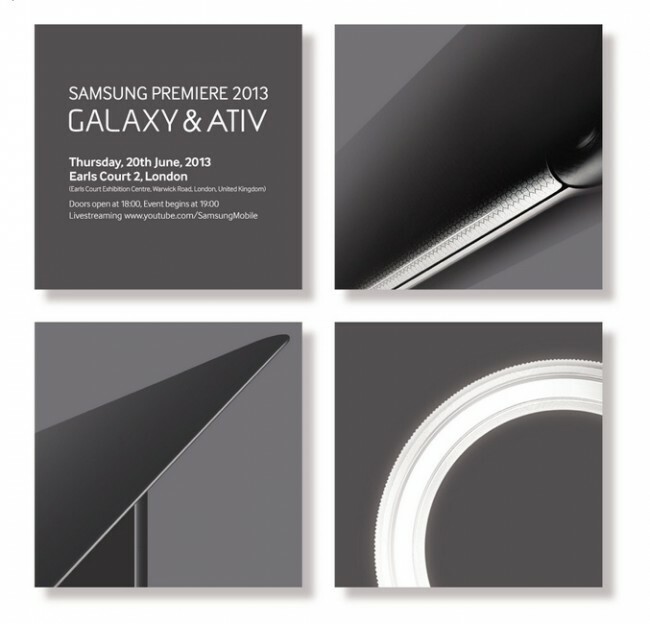 On the invite, we’re seeing both “Galaxy” and “ATIV” brands mentioned, with Galaxy being the one we care about. “ATIV” are Samsung’s Windows-focused products, while “Galaxy” tends to lean towards the Android side of the world. So what’s in store? The invite shows three teaser images that resemble either a tablet, thin display, and potentially even a camera. Will we see Samsung’s next-gen tablet to partner up with the already-launched Galaxy S4? Will there be a new Galaxy camera on hand, potentially dubbed the “Galaxy S4 Zoom”? Thankfully, it will be streamed at youtube.com/samsungmobile for the world to discover together. Video: Can You Stare at the Samsung Galaxy S4 for 60 Minutes Straight?